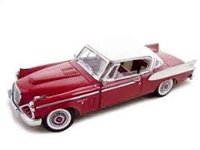 The 1950 Studebaker Champion Starlite Coupe has been done in 1:18 scale by several model makers. They all feature opening hoods, doors & trunks. Several colors by Yat Ming are still available at $31.99 HERE . The other colors from Yat Ming and the ones from Highway-61 are occasionally available on eBay in either bid or Buy-It-Now format. The 2 door hardtop Studebaker Starliner was done in 1:18 scale by Matisto. It features an opening hood, doors and trunk. The model is long since out of production but can still be purchased HERE at $26.49 and can be found occasionally on eBay . 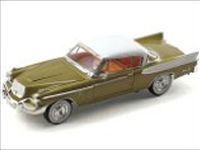 The 1957 2 door hardtop Studebaker Golden Hawk was a redesign of the Starliner and was done in 1:18 scale by Anson Classic.The 1958 was done by Road Signature by Yat Ming in 1:18 scale and in 1:32 scale by Signature. They all feature opening hoods and doors. The Yat Ming version at $61.99 and the Signature model at $13.49 can be found HERE . The models are long since out of production but all can still be found occasionally on eBay . The 2-door 1963 Studebaker Avanti was done in 1:18 and 1:32 scale by Signature and featured an opening hood and doors. The models are out of production but can still be purchased HERE in 1:18 scale for $39.99 and 1:32 scale for $14.49. They both can be found occasionally on eBay . Most recent models are added to the bottom.